High Court is in no hurry to tear down illegal Arab housing in Hevron area. 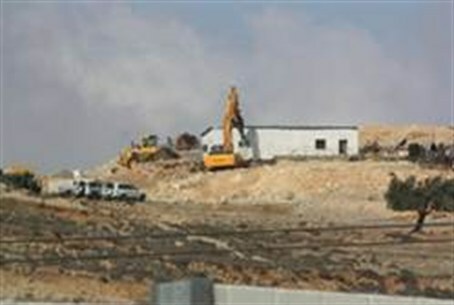 High Court judges are in no rush to approve the demolition of illegal villages built by Arabs in the southern Hevron Hills area, although their illegality is undisputed. The court heard on Monday a motion by the Association for Civil Rights in Israel and a resident of one of the villages, which is located within an archeological site and thus cannot be retroactively approved. The judges said that the evictees must be offered an alternative place of residence. Judge Hanan Meltzer noted that "the role of the Military Administration is to provide an alternative to the residents." Judge Edna Arbel concurred and asked where the residents would live if they are evicted. After years of looking the other way at illegal Arab construction, the Civil Administration in Judea and Samaria has recently begun to apply the rule of law to Arabs, thanks in part to the activity of the NGO Regavim, which fights for Jewish property rights in the Land of Israel. Several demolition orders have been issued against illegal Arab villages in the southern Hevron Hills – and the residents have appealed to the High Court to try and block implementation of the orders.